The state has launched a program to distribute opioid overdose rescue kits, like this one, in local communities. Adams says that 55 percent of overdoses occur in a home environment. “I’m so, so frustrated when I go around the country and everywhere I go there’s someone who comes up to me and tells me about their daughter or their son that died of an overdose in the bedroom next door or just downstairs. And to think that, if they’d had Naloxone, they potentially could have intervened, they potentially could have saved their loved one’s life,” Adams said. Alaska got a $4.2 million grant from the federal Department of Health and Human Services to fund Project Hope for five years. On the Kenai Peninsula, Narcan kits are available in Kenai and Homer at the public health centers, in Seward during twice-monthly public health clinics through SeaView Community Services, and from Dr. Sarah Spencer in Ninilchik. The Kenai Public Health Center has been distributing the kits since 2017. “We’ve had a really good response. 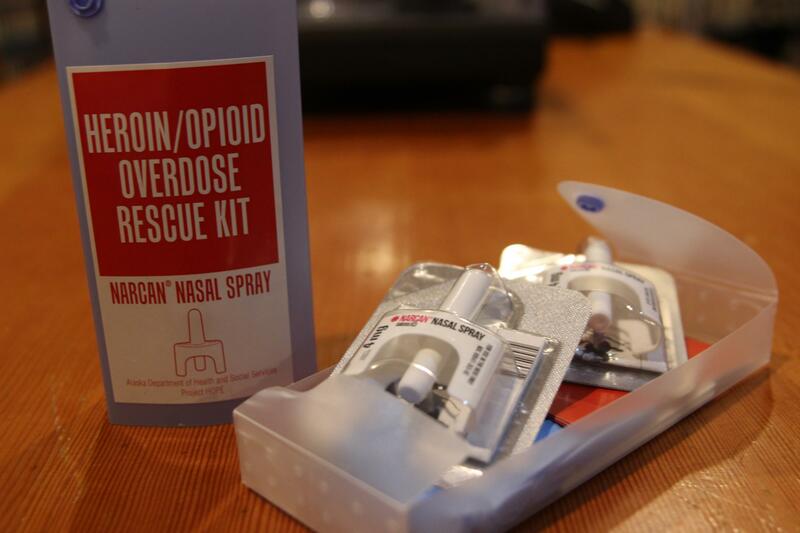 We would like to get a better response from the people who are actually using the heroin but we’ve given out a lot of Narcan kits,” said Tami Marsters, a public health nurse at the Kenai center. The kits consist of two nasal Narcan doses, instructions, gloves and a face shield, and are free and available on a walk-in basis. There’s a little bit of training and paperwork involved, but no personal information is requested or recorded. Symptoms of an overdose include unresponsiveness, clammy, possibly blue-tinged skin, constricted pupils and low or absent breathing and pulse. Narcan is easy to administer as a nasal spray and can be given without fear of side effects. “The thing about Narcan is even if a child gets ahold of it and uses it, it won’t hurt them. So if you give Narcan to somebody who is not in an opioid overdose it won’t hurt them, but it won’t help them, either,” Marsters said. Emergency responders should always be called first, though. For one thing, Narcan only lasts about a half an hour, and the opioids can work longer. For another, Narcan can create symptoms of withdrawal. “The person that they’re giving the Narcan to may come out of that overdose not very happy, (they) may be combative or aggressive, so care needs to be taken in those situations,” Marsters said. The Kenai Public Health Center will conduct Narcan trainings for groups, even traveling to your location to do so. And it has medication disposal bags available for free on a walk-in basis. The center is on Barnacle Way in Kenai, open from 8 a.m. to 5 p.m. Monday through Friday.